Malibu, saintbob and Ozymandiasmv like this. What a great idea, heading to amazon now! Before you give it a great rating, wait to see how long it lasts. Some fizzle quickly, some last a long time. My rechargeable ones --- one of them lasted about a year, the other maybe four months. Same brand, ordered at the same time. I have a collection of "standard" battery operated ones, too. Waiting for me to get new batteries and figure out which ones work and which ones don.'t. The best one to date is a red and green christmas special with either on or off blinking. It seems the more sophisticated they made these, the less reliable they became. So far so good. Only use it at night and early morning. Love that it is rechargeable and has 3 motions. I’ve bought others and more expensive and crap. I like the lead collars. I bought one from howling dog Alaska. They are $10.00 around the holiday can make a good Xmas gift for dog people. I got mine last year and still have not lost or thrown out the charger by accident. I think these are very cool, but I also think they're just a start if walking dark-colored dogs out at night. Just the other day, I was driving in a dark area and came up on a man walking a large, black dog. The man was wearing dark clothing. The two were virtually invisible. Then the dog turned and I saw the brilliantly red, lighted collar around its neck. At the wrong angle, even well-lit, the collar did not help me see the pair. And even after becoming aware of it and realizing what it was, it didn't do much to make those two any more visible. It was just a floating red line in the dark. At the very least, the owner should be wearing light clothes and/or a reflective vest or sash. And I think a reflective vest on a black dog is an excellent idea as well. 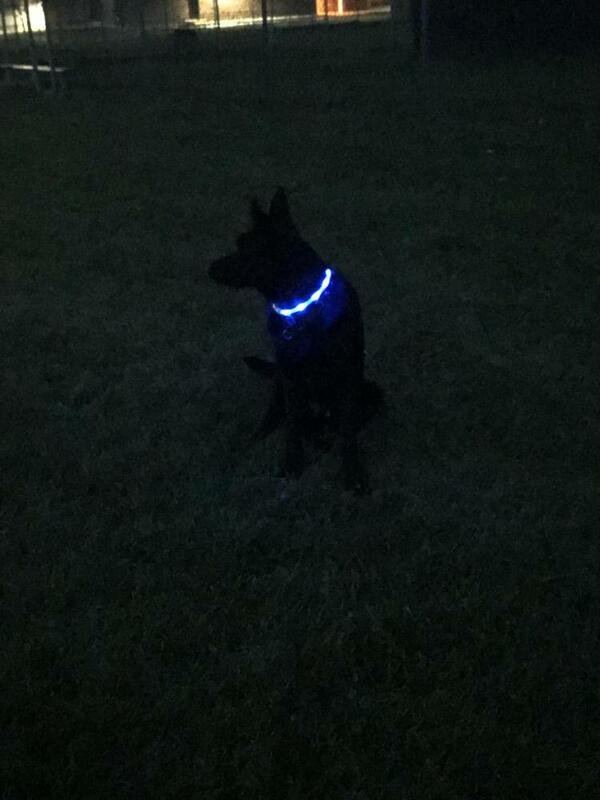 Not to diminish the help those glowing collars can give...but I don't think they should be relied on 100%. Cool, looks just like the one I bought for $50. Very cool, thanks! Gonna get one too now! I don’t use the full collars but I have the blinking (or solid) light collar attachment. It’s secure, on a mini carabiner, 20hrs, weather resistant and I grabbed a couple for $4.99 (reg $8.99 I think) at a Bay Area pet store chain. For any of my “neighbors” interested, I also just found out that Pet Food Express replaces the battery for free for life. I love these for camping, night hikes, or just pottying my deaf dog. I like them too but I wish they were more durable. I would use them if I walked on a road at night - but I also have two reflective jackets and two reflective vests and would choose one of those to wear at night, too. My dogs have about 6 acres around the house to have access to at night. The collars or a blinking light attached to a regular collar help me keep track of my dogs at night.